> Conductor > The Long Tail of Search: Missed Revenue? Marketing 101 dictates that marketers target the largest possible addressable audience for their product. Unfortunately, many marketers approach SEO the same way and focus disproportionately on 1-2 keywords while ignoring the long tail of search. 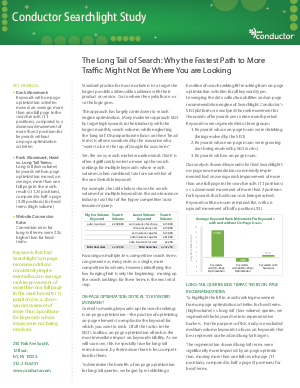 Read this whitepaper to learn how leveraging long-tail terms can significantly increase search volumes.